The book provides a brief overview of the benefits of Human Design, and includes an introduction to type, aura, and strategy, inner and outer authority. Included is a glossary of Human Design terminology and a resource guide for further exploration. It is a perfect introduction for friends and family. Dharmen & Leela and alumni students from previous transformation courses discuss The Transformation Course and its personal impact. Recorded in 2014. Our human aura extends two arm-lengths in every direction. From the mechanics of Human Design, you can begin to recognize your aura, and how it is designed to meet life. In this two-hour class, you will meet your aura, and learn how to align your aura to your unique frequency. Recording includes experiments and observations with the live class group, questions and answers. Our most fundamental drive as humans is the law of attraction. Human Design offers a mechanical view of how attraction operates in your life, based upon the openness in your design. What is the Law of Attraction? How does it work in my design? How can I notice this in my life? What is the difference between attraction and resonance? 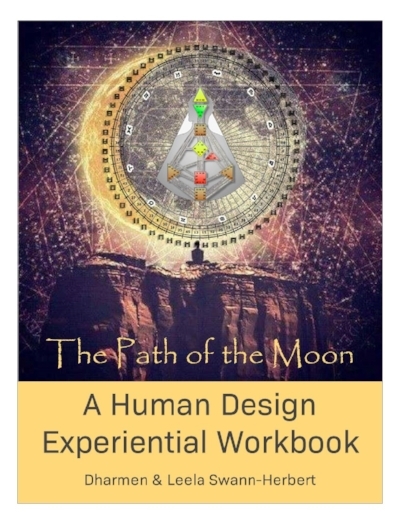 HEBREW TRANSLATION: The Path of the Moon - A Human Design Experiential Workbook. Are you ready for a deeper dive into your experiment? Open House recorded live by Dharmen & Leela in their online classroom for the 2018 Transformation Course. Note: see Transformation Course page for 2019 course details/dates. Living with the emotions is one of the biggest challenges on planet Earth. Human Design provides us a mechanical view into how the emotions operate through the Solar Plexus Center. What is emotional chemistry? How do I live with my emotions? How do I live with the emotions of others? In this class you will learn about how your Solar Plexus Center is designed, if it is defined our open. This two-hour recording includes an informative lecture, and a lively class question and answer session. Recorded live in Sedona, this course is a wonderful introduction to Reflectors by a Reflector.